TAMA NA ! SOBRA NA ! This was the cry of the people. 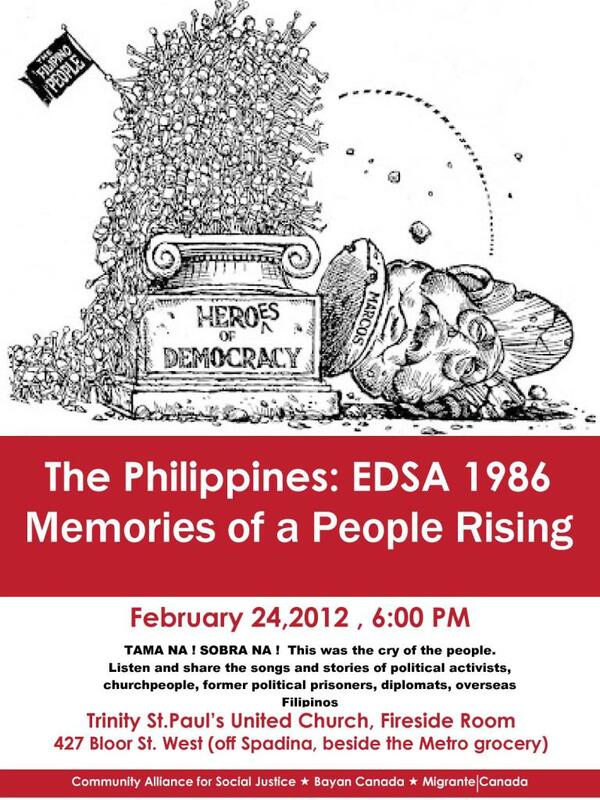 Listen and share the songs and stories of political activists, churchpeople, former political prisoners, diplomats, overseas Filipinos. For more info, contact Ben Corpuz at (416) 886-8921. 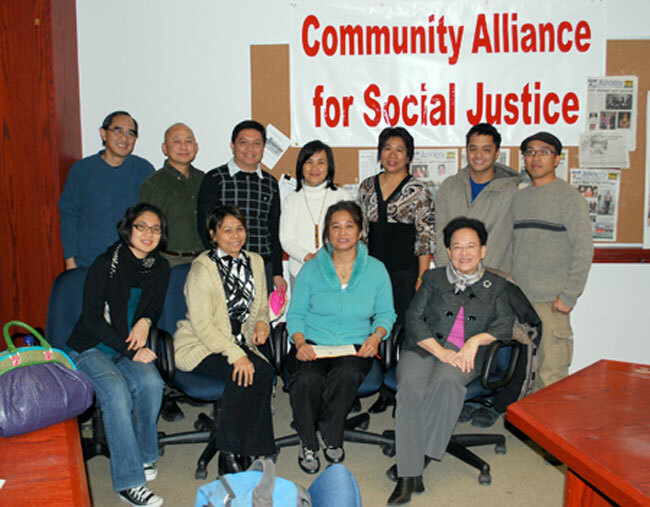 The year 2011 saw a good number of activities that kept CASJ alive among friends, member organizations and the broader Filipino-Canadian community. 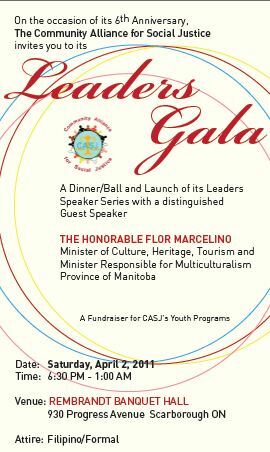 The alliance held its first Leaders’ Gala on April 2 where Flor Marcelino, Manitoba Minister of Culture, Heritage, Tourism and Sports and Minister of Multiculturalism was guest speaker. Some 270 guests graced the occasion held at the Rembrandt Banquet Hall in Scarborough. In collaboration with the Philippine Press Club-Ontario, and Kamalayan, CASJ sponsored a public forum on Aug. 19 to discuss the Spratlys issue in relation to the Philippine extractive industries and sovereignty. 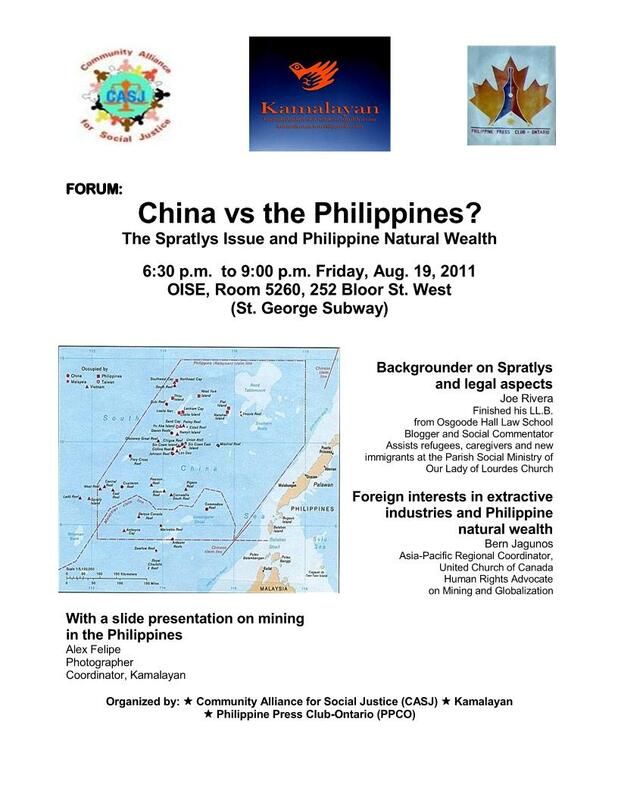 Titled, “China vs. the Philippines: The Spratlys Issue and Philippine Natural Wealth,” the forum was held at the OISE on Bloor St. West, attended by almost 60 people that included students, representatives of various organizations, the Consul General of Toronto Pedro Chan, and former Consul General Clemencio Montesa. On Sept. 16, at the gathering “Pinoy MPP Candidates Speak” on Sept. 16 at the Filipino Centre-Toronto, CASJ and other community leaders called for Filipino-Canadians to start a wave of support for Filipino candidates in the Oct. 6 provincial elections. Nerissa Cariño, NDP candidate for Scarborough East, and Cheryll San Juan, Green Party candidate for Etobicoke Centre, shared their platforms with dozens of Filipino community leaders. Dozens gathered to share and hear testimonials from the Philippine martial law era in “An Evening of Music and Poetry, Solidarity and Memories of Struggle” on Bloor St. West on Friday, Sept. 23, the 39th anniversary of the declaration of Martial Law in the Philippines. Organized by CASJ, Migrante Ontario, Anakbayan, Filipino Migrant Workers Movement and Philippine Advocacy through Arts and Culture at Trinity-St. Paul United Church, the event featured stories of detention, torture, struggle and survival, songs and poetry of that period in Philippine history. * On Nov. 23, 2011, two years after on the same day in 2009, after what has come to be known as the deadliest day for journalists in modern history shocked the Philippines and the world, CASJ joined the Philippine Press Club of Ontario at St. Luke’s Church in Toronto to observe the first International Day to End Impunity. This was attended by some 80 people of diverse backgrounds and representatives of various organizations that included the National Ethnic Press and Media Council of Canada, BAYAN and Migrante Canada formations in Toronto, Anakbayan, and the United Youth for Peace and Development. CASJ participated in two panels in the 2011 Biennial Conference of the Canadian Council for Southeast Asian Studies in October – the panel on Experiences of the Filipino-Canadian Second Generation and the panel on Transnational Connections and Local Development. CASJ is involved in an ongoing collaborative venture with Dr. Philip Kelly of York University – with research teams in Toronto, Hamilton, Winnipeg and Vancouver – in Filipino Youth Transitions in Canada (FYTiC), the first nationwide study of Filipino youth experiences in Canada. On Sept. 19, the project launched an online survey of Filipino-Canadians. A questionnaire has been distributed nationwide. To ensure a diverse representation of respondents, CASJ established partnership with grassroots organizations through Migrante Canada and GABRIELA Ontario. More recently, it facilitated links between GABRIELA Ontario and Migrante on the one hand, and Ryerson University on the other, for a study on women in the live-in caregiver program. August 19, 2011, 6:30 p.m. – 9:30 p.m.
China, the Philippines, and Vietnam are amongst those laying claim to a small group of islands off Palawan… apparently there is oil to be had, and where there’s oil good times are just around the corner. Oil, is only one of the abundant natural resources in the Philippines, how about the others? What is the relationship between our nat’l resources and profit/poverty? Joe Rivera is writer and former lawyer. Bern Jagunos of the United Church of Canada and the Philippine Solidarity Group of Toronto. Alex Felipe, a photographer who documented large scale mining in the Philippines. Inspired by the Claro M. Recto Dinner in the Philippines during the 1970’s, CASJ, on its 6th anniversary, launches “Leaders’ Speaker Series”. This annual series will feature a speaker with the hope of inspiring the Filipino-Canadian community, especially our youth, towards becoming leaders for social justice. Many Filipino immigrants have experienced deprofessionalization in the Canadian labour market. This failure of Canadian employers and institutions to recognize the training, education and professional experience of immigrants is a widely acknowledged problem. A growing concern, however, is how the children of immigrants are faring in terms of their educational and employment outcomes. The affected caregivers and their advocates have articulated eloquently the recommendations and the basic conditions that must be changed through policy. Basically these may be interpreted to be beneficial to the caregivers alone. I wish to articulate and emphasize the other side of the picture. These changes that we seek, mainly giving permanent resident status to caregivers, removing the live-in requirement and removing the employer-specific feature – will benefit Canada tremendously. 1. The Ombudsman of Ontario released on Sept. 29, 2008 its report on the investigation of the Special Investigations Unit (SIU) on the latter’s handling of probes of cases of police officers in incidents involving the death or serious injury of civilians. The report was highly critical of the conduct of SIU in many cases, as it concluded that the SIU was biased in its investigations in favor of the police, and that it allowed the police to control its (SIU’s) investigations. CASJ was directly interviewed in this probe and CASJ submitted its case to the Ombudsman stating the SIU did not conduct a proper and fair investigation into the fatal shooting of Jeffrey Reodica by a Toronto Police officer in May 2004. CASJ Board: (Standing) Ricky Esguerra, Hermie Garcia (President), Ben Corpuz (Chairperson), Mila Astorga-Garcia, Helen Reyes, Ben Bongolan, Alex Felipe. Seated: Mithi Esguerra, Paulina Corpuz, Julie Nanquil and Marlene Mogado. Not in photo: Bert de Lara, Jonathan Canchela, Jojo Geronimo, Popoy Caña, Wilma Delo, Jun Enverga and Rose Bustamante. ﻿﻿﻿﻿﻿TORONTO — The Community Alliance for Social Justice (CASJ) elected new members to its Board of Directors on Sunday, Dec. 14, to take in new blood and veteran advocates to face the challenges in the next two years, 2009-2010. You are cordially invited to the General Assembly and Election of the Board of Directors of the Community Alliance for Social Justice. Nearest Major Intersection: Princess Ave. & Yonge St.